I am not surprised that Apple is ahead of everyone. 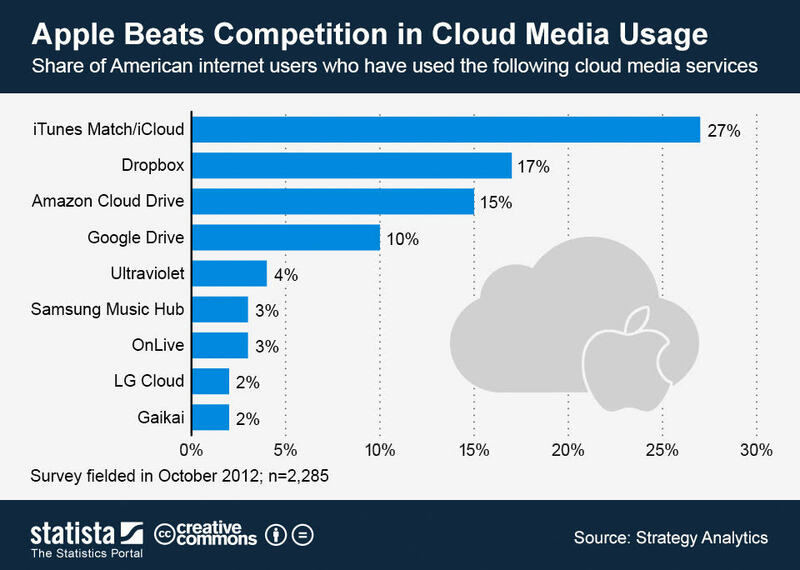 Almost every Apple user is also using iCloud, and most users also use iTunes. This alone should designate Apple as the winner of this contest. Dropbox gets an honorable second place. This entry was posted in Analytics, data analytics, big data, big data analytics, data on the internet, data analytics meaning, Cloud technology, computing, storage, data, Computers, Data Analysis and Visualization, Data storage, hard disk drives (hdd), solid state drives (ssd), Datacenters and data centers and tagged apple vs dropbox, Cloud Media Usage Ranking, dropbox 500 million users, online data storage, online storage. Bookmark the permalink.